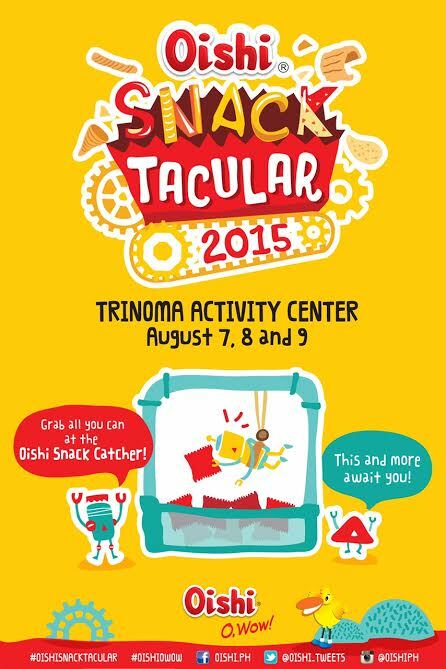 Oishi Snacktacular is Back + Bag O' Shrimps experience! This year, Oishi brings Snacktacular back and this time, at Trinoma Activity Center! It will be a fun-filled event that will make people of all ages go "O, Wow!" for sure! Same as last year I believe, you will play and run in awesome booths and be refreshed with Oishi products! This 3-day event happens next week so block off your calendar! August 7, 8 and 9. I highly suggest you wear your most comfortable outfit and shoes because I can imagine the crowd! It was a fun crowd don't worry! My favorite station last year was Oishi Make Your Own Snack were I get to invent my own Oishi Flavored snacks which my husband loves and crave for until this very day! If you are a fan of one or 2 or all the members of Team O, please do join as they will grace the event with performances! Elmo Magalona, Slater Young, Ramon Bautista, Kathryn Bernardo, Daniel Padilla and their newest endorser Alex Gonzaga! What is your ultimate favorite Oishi snack? I can't pick just one but I remembered hauling for Oishi's OATIES drink! For more information, log on to www.oishi.com.ph or visit Oishi's Official Facebook page. It sets my IG by storm as my family and friends were messaging me on how they were craving for Shrimps and Corn on cob after seeing my photo! Well, what I tell them? They should! Because they smell so satisfying and tastes really good! On a side note, let me share that I'm allergic to seafood #lol , but...because I am a diligent food reviewer (a.k.a. matakaw talaga), I gave this a try when it was delivered fresh and hot and it is indeed at par with what we had in the US! It is more spicier though and after checking their site, they have 4 level of spiciness so you can always tell them how "spicy" you would like your bag of goodness to be! The shrimps were huge and fresh and the corn on the cob was really sweet and tangy at the same time! I love it! I may have just 2 shrimps and a few itches, it was totally worth it! Visit www.bagoshrimps.com for more details. How will you spend your remaining weekend? are you dining out or staying home?